Complete Organics fertilizer mix developed by Bio Grow in cooperation with Femeg – GK-Organics. Guanokalong powder is mixed in combination with GK-Organics products like: sea weed powder, palm tree ashes, cotton seed powder, fish powder and volcanic loam. 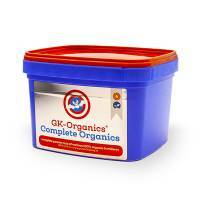 This unique mix of products represents a full body pure organic NPK value with loads of trace elements. Mix Complete Organics (Light=0.5L, Medium=1L, Heavy=3L) with 50 liters of soil.